This Eggless Spaghetti Carbonara is the perfect way to get your carbonara fix without the eggs. And it’s ready in just 15 minutes so it’s the perfect weeknight dinner! 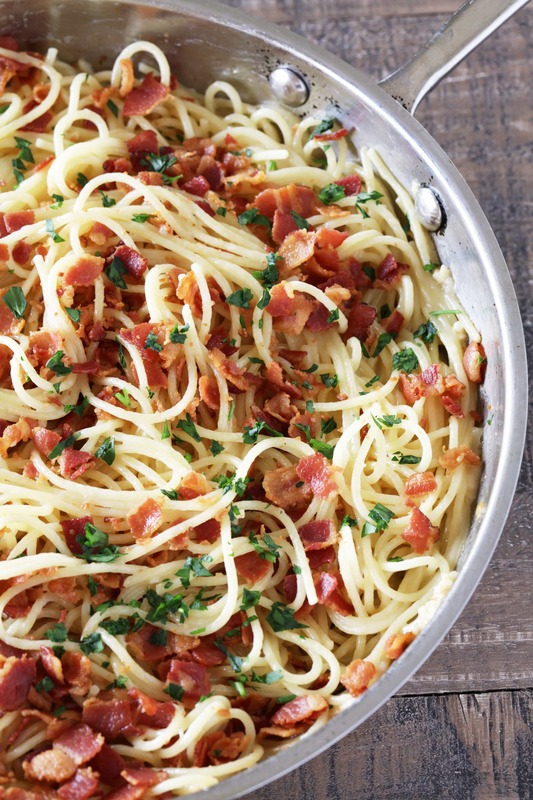 Spaghetti Carbonara is one of those classic pasta dishes that is straight up comfort food. Plus, bacon. Right? For some reason I have lots of friends who are a little freaked out by the thought of putting raw eggs into the pasta. While the eggs definitely get cooked by the heat of the pasta in traditional carbonara, they still get a little worried. Then there are the friends and family with egg allergies! I decided to come up with an egg-free version of spaghetti carbonara so that everyone can enjoy this delicious meal at my table. This Eggless Spaghetti Carbonara is the perfect way to get your carbonara fix without the eggs. And it's ready in just 15 minutes so it's the perfect weeknight dinner! Put diced bacon in a cold skillet and heat over medium-high heat. Cook bacon, stirring occasionally until crispy, about 10 minutes. Remove bacon bits from pan and grease and let drain on a paper towel lined plate. Remove most of the bacon grease from the skillet, reserving about 1 TB in the pan. Return the pan to heat and add in the butter and let melt. Add in the garlic and saute 1 minute. Stir in salt and heavy cream. Pour cooked and drained spaghetti noodles into the skillet and toss to coat. Stir in parmesan cheese. Serve hot topped with crisp bacon and parsley to garnish. 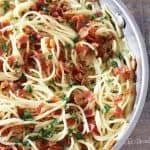 I’m allergic to gluten, chicken and eggs so this recipe is really awesome, I just changed the pasta to a gluten free one. Is so radio to make and tastes awesome! Like Aglio Olio! Next time I’ll try putting in the spaghetti water cause it became quite dry. I make this tonight and it is delicious! My son is allergic to eggs and I’ve missed making Carbonara for dinner. This is great. Thank you! Love this recipe. My wife doesn’t eat eggs, perfect for us. I’m excited to try this! AddIng the raw egg has always stopped me from making Carbonara. In Step 4, the cream gets added to the skillet? Want to make sure I’m making it right? Love this recipe. It tastes great and is easy to make! I made this last night for my family, becasue the raw eggs freak me out. This was delicous, would highly recommend, i did add about one cup of cream and extra cheese. Was so so good, can’t wait to make again. I made this tonight and we all loved it. I added just a bit of reserved cooking water from my pasta (about 1/4 cup) just to give it a little more sauce. I love a traditional carbonara but this is a great alternative. It’s always good to have some quick recipes like this for those busy nights. When did you add the pasta water to the recipe? I’m excited to try this version!! I didn’t add any pasta water to this recipe because I have the cream, but definitely can add a scoop in if you like the added starch. 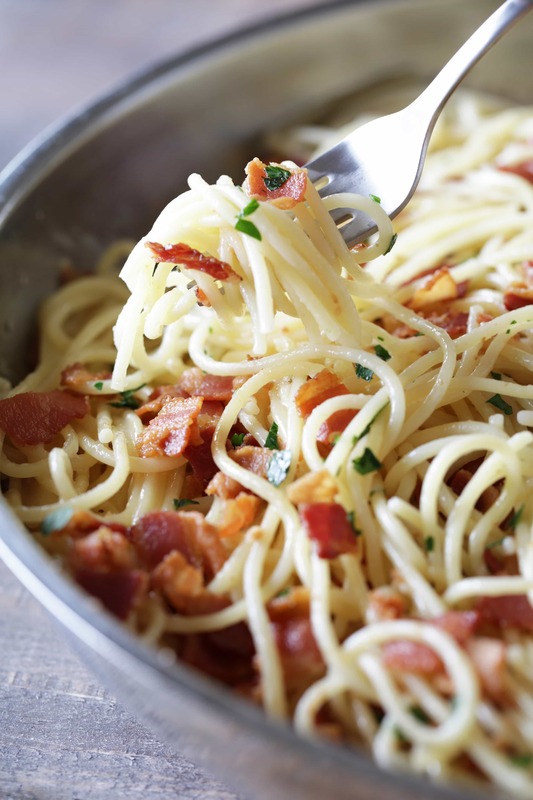 Oops .. forgot to rate it ..
Hi Rachel, what I loved the most about this eggless spaghetti carbonara recipe was the fact that it can be cooked in just 15 minutes! It’s perfect for me and my husband. Thanks for sharing! No.. Carbonara without eggs? Please. It’s not carbonara. Did you read anything I wrote about why I created this recipe? Did you watch the video where I talked about it? I LOVE traditional Carbonara, but I also know people in my life who needed an alternative. I never claimed this to be traditional Spaghetti Carbonara. It’s an eggless alternative for those that need it. Or for people like me who tend to curdle the egg when making a traditional carbonara sauce because I usually tend to cook the sauce for too long, which is the trick with egg-based custard sauces…to cook the sauce just long enough to neutralize the salmonella and other nasty buggers but not so long that the eggs start curdling. Also even if I manage to get the sauce right…..reheating the leftovers in the microwave tends to lead to the same “bits of scrambled egg in the pasta” effect. My son has an egg allergy and he loves this. Thank you! I also have an egg allergy! I love eggless recipes like these 🙂 Thank you, the Stay at Home Chef! My son is allergic to eggs, so I’m really happy with this recipe. But for people like me who are allergic to eggs this is good choice. I developed an egg and seafood allergy after I had a stroke when I was just 33 so eggless dishes are welcomed here!